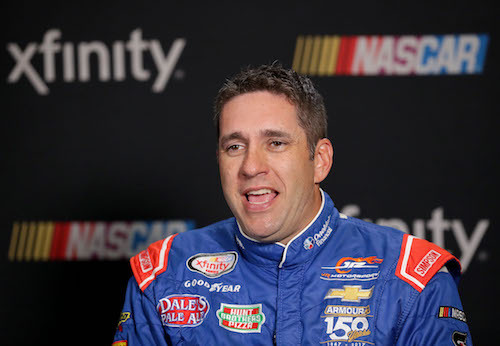 Elliott Sadler and Noah Gragson were named 2018 Most Popular Drivers in the NASCAR Xfinity and Camping World Truck series, respectively. This year marks the third-consecutive season and the fourth time, overall, Sadler has been voted Most Popular Driver in the Xfinity Series. The 2018 season also is Sadler’s last as a full-time NASCAR driver, as he announced his retirement earlier this year, effective at the end of the season that concluded Nov. 17 at Homestead-Miami Speedway. Sadler’s third-straight win of the award is the seventh-straight for a JR Motorsports drivers, following Chase Elliott in 2014 and 2015, Regan Smith in 2013 and Danica Patrick in 2012. Sadler won the award in 2011 as a driver for Kevin Harvick Inc. in his return to the series after several seasons in the NASCAR Cup Series. Sadler posted 14 top-fives and 24 top-10 finishes in the 33 races of 2018. He wound up fifth in the season-ending standings after being eliminated in the “round of eight” round of the playoffs. Gragson will replace Sadler in JRM’s No. 1 car in the Xfinity Series in 2019, leaving the Truck Series after two full seasons as a driver for Kyle Busch Motorsports. He finished second to champion Brett Moffitt in the 2018 end-of-season Truck Series standings. Gragson claimed one win in 2018 at Kansas Speedway. He also finished in the top-five eight times and in the top-10 17 times in 23 races. Sadler and Gragson officially will be awarded Dec. 8 in Charlotte, North Carolina, during the Xfinity and Truck series’ joint awards banquet.